The formal gardens at Kilruddery were laid out in the 17th century and, uniquely among Irish gardens, still exist in their original style. This makes them a fascinating place for gardeners, a real glimpse into the gardening history. The gardens are very large and in parts laid out formally, with neatly trimmed beech hedges forming patterns and much statuary, while other parts, notably the densely wooded “wilderness”, act as a foil. The twin canals, or ‘long ponds‘ are each 187m long and once were stocked with fish to supply the kitchens. One of the most interesting parts of the garden is the Sylvan Theatre, which is as its name suggests an area built in a woodland setting designed for performances. Although these were popular throughout Europe in the 18th century, few survive and this is the only one in Ireland. It is still used too – Killruddery has a very active programme of arts events. 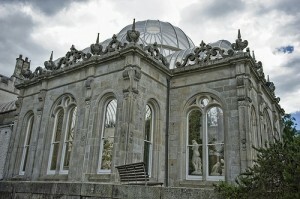 There is a beautiful and perfectly restored Orangery which houses a collection of 19th century Italian marble statues. It was built in 1852 and modeled on Crystal Palace in London, though obviously it’s a lot smaller. Access to the Orangery is only available with tours of the house. Film buffs will be entertained trying to spot locations from some very well known movies that used Kilruddery as a location, including “Far and Away“, “Dancing at Lunaghsa“, “The Count of Monty Cristo” and “The Magnficent Ambersons“. The gardens are open daily from May to September and at weekends only in April and October. Kilruddery House has been home to the to the Earls of Meath since 1618 and as it is their family home is accessible on a limited basis and by guided tour only. Thanks for bringing that to my attention – I believe it is correct now.